Apple Vice-President of Worldwide Marketing Phil Schiller announced the new aluminum unibody 17″ MacBook Pro which, at 2.50cm thick and 2.99 kg, is the thinnest and lightest 17-inch notebook in the world, according to Phil. And a built-in battery that delivers up to eight hours of use and up to 1,000 recharges for more than three times the lifespan of conventional notebook batteries. The processor is a 2.66GHz Intel Core 2 Duo with 6MB L2 cache with an option for a 2.93GHz Intel Core 2 Duo with 6MB L2 cache. 4GB of 1066MHz DDR3 SDRAM and support up to 8GB. And a 320GB hard drive. The 17-inch screen supports up to 1920 x 1200 pixels and is LED-backlit with optional antiglare display. Two NVIDIA video cards: GeForce 9600M GT with 512MB GDDR3 memory and GeForce 9400M with 256MB of shared DDR3 SDRAM . The MacBook Pro also includes a Firewire 800 port, 3 USB 2.0 ports, gigabit ethernet, mini DisplayPort, audio line in/out and an ExpressCard/34 slot. The 17-inch MacBook Pro is available for pre-order starting at $2799. Battery replacement will cost $179. First look with photos and video. 17″ MacBook Pro tech specs. 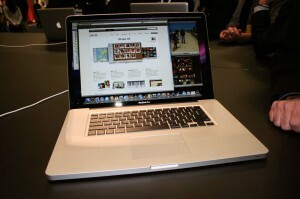 The 17″ MacBook Pro ad.